During my childhood we practically grew up on butter cakes and marble cakes. I am sure most of you would have had your fair share of these cakes as well. Those were the days when fancy cakes were practically non-existent. If my mum was not making any marble or butter cake that month, we would usually get her to buy pre-packed slices from the local bakery or the "roti-man". When we were kids, an Indian man would ply our neighbourhood streets with a motorcycle (or sometimes they could be on a bicyle) selling bread and all sorts of snacks hanging on the back of a box and also on the handle bars of his two-wheeler. 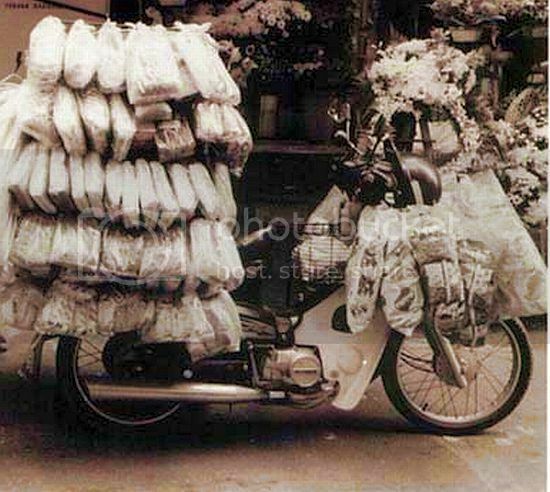 It really seemed like a circus balancing feat for the rider, with so many packs of bread and snacks on his motorcycle. The vendor had all sorts of local breads, cakes, local snacks like peanuts and crackers and sweets. One favourite goodie of mine would be the cream bun and of course my other, marble cake slices. Sadly the "roti-man" is now practically extinct in the cities. You could however still find them selling their bread in this manner in the villages but even then, it is a rarity. 1) Heat oven to 180C. 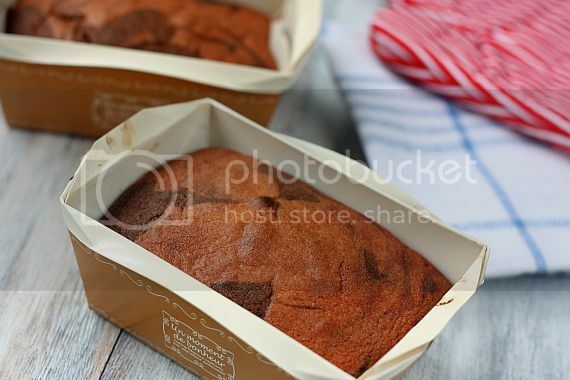 Grease a 20cm cake tin and line the bottom with parchment paper. 2) Beat the butter and sugar together until light and fluffy. Then add the eggs, one at a time, mixing well after each addition. 3) Add the vanilla extract and milk, mix well. 4) Gently fold in the sifted flour and salt in 2 to 3 additions. 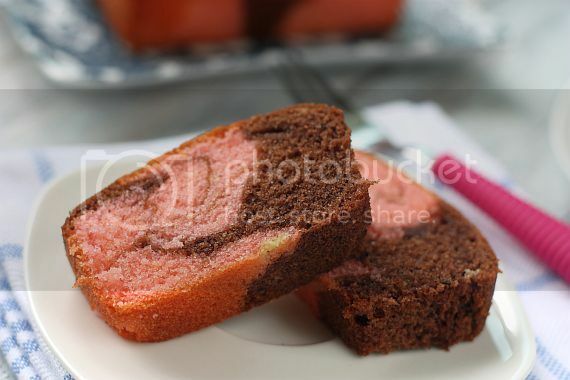 6) Take 2 spoons and use them to dollop the chocolate and pink cake mixes into the tin alternately. When all the mixture has been used up, tap the bottom on your work surface to ensure that there aren't any air bubbles. Take a skewer and swirl it around the mixture in the tin a few times to create a marbled effect. 7) Bake the cake for 45-55 mins or until a skewer inserted into the centre comes out clean. Turn out onto a cooling rack and leave to cool before unmolding. The dual colours contrast look really nice ! Just the look itself already makes one drool... I am sure it tastes great too! 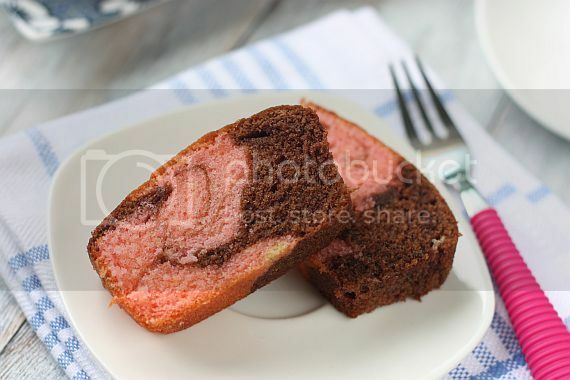 It is very special and nice colour marble cake. I believe children will like it. It takes skill to ride a bike like the man. Your cake is gorgeous. I've never seen such a pretty color combination. Perfect for summer. Love how you blend the colours. Nice. Love the colour, and must be very good. 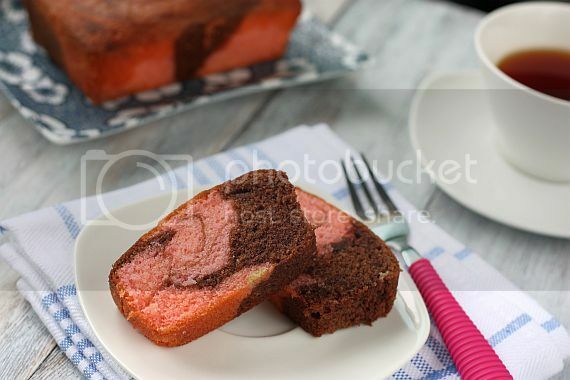 the marble cake looks wonderful! I like this! Pretty! Thanks for sharing! Hi Soni, I'm not sure if you are staying in Singapore but I got the cake mold from Daiso. It's made of paper and therefore great as give-aways. If I remember correctly there should be about 4 pieces in a pack.